Hands aloft, stowing the 179-foot barque’s mainsail. A circumnavigation is the stuff of dreams, the ultimate sailing challenge. Few pull it off. 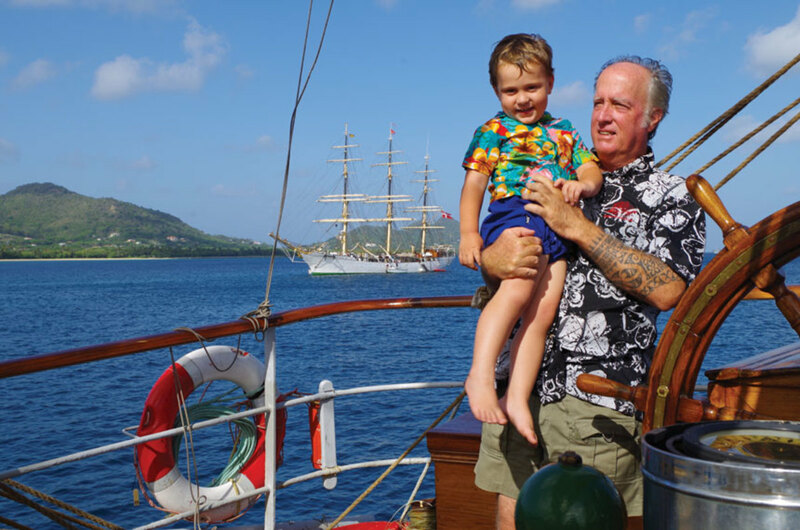 Making one’s way around as part of a crew under square rig is even more of a storybook adventure — and thanks to the double-topsail barque Picton Castle and her visionary skipper, Capt. Daniel Moreland, hundreds of people have lived that dream. A crew of professionals and willing amateurs (the trainees) are setting out now on what will be the 179-foot ship’s seventh circumnavigation, a yearlong bluewater odyssey. 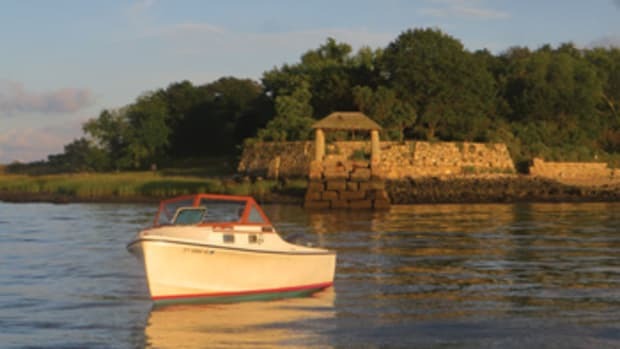 The voyage will extend from Nova Scotia to Bermuda to the Gulf of Mexico, then continue through the western Caribbean and Panama Canal before going on to the Galapagos and Pitcairn Island (home of descendants of H.M.S. Bounty mutineers). Next will be the idyllic South Pacific islands, such as Mangareva and Vanuatu, with their fringing coral reefs and traditional ways of life, then on to the Far East and exotic Bali. Next, across the Indian Ocean to Madagascar and around the Cape of Good Hope to Cape Town, South Africa; across the Atlantic via Saint Helena (the mid-Atlantic island where Napoleon Bonaparte spent his exile) to the enchanting islands of the eastern Caribbean; and home to Nova Scotia. It’s a trade wind and flying fish voyage, nearly all in the tropics, where the warmth of the weather is matched by that of people. Moreland has completed seven circumnavigations under square rig: six as master of Picton Castle and one, in his youth, as mate of the brigantine Romance. Veterans of circumnavigations on “the Castle,” as they affectionately call her, return tanned and fit, some showcasing Polynesian tattoos done the traditional way, with a boar’s tooth and hammer. They boast stunning photos and sea bags full of memories. 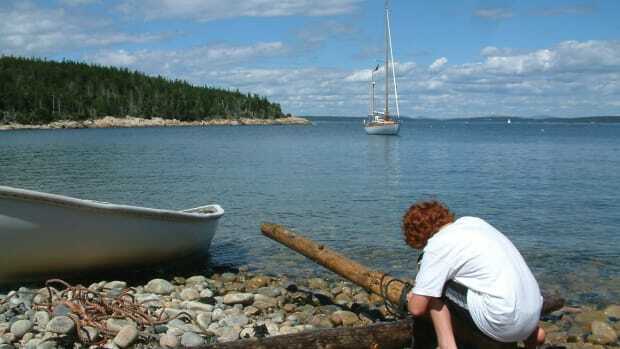 Along the way, they’ve developed practical competencies, such as caulking, painting, rigging, small-boat handling and sail-making. 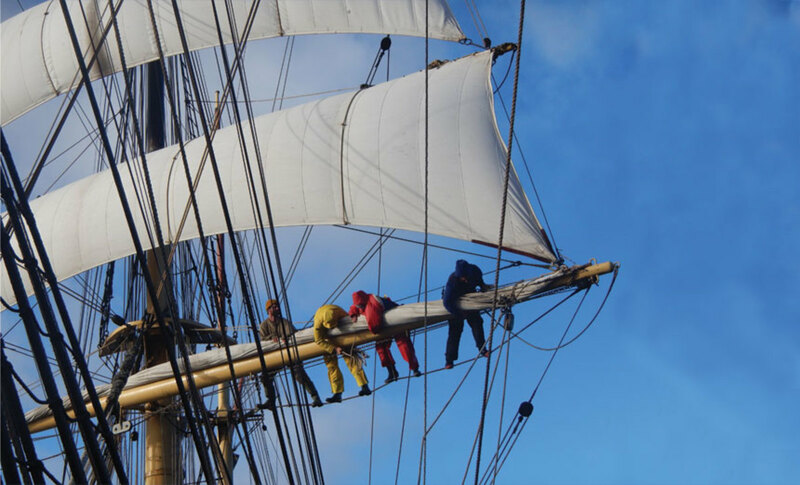 The crew make all of Picton Castle’s 23 sails aboard ship by hand. They also explain, in varying ways, that they have refined their coping skills, sometimes under trying circumstances, managed their expectations in a situation where the good of the ship comes first and taken initiative while confronting problems large and small — all while having the time of their lives. Sail training today appeals to many adventurous sorts of people, most of whom do not go on to careers as professional mariners. Rather, these are voyages for life. Some sacrifices are required to pull off a voyage on this scale, as inconveniences exist in a sailing ship at sea, but the rewards are in their own league. Crewmembers recount incredible experiences. After a while it is just a matter of course to race aloft to stow the main royal, the highest sail. Almost 100 feet above the pine decks, with your feet on the footrope and your belly on the yard, compensating almost imperceptibly for the roll of the ship, you are the center of a circle of blue ocean, set off, perhaps, by the sun setting ahead — a vista worthy of royalty. Most voyagers say the gratifications keep coming. They grow in intensity as the voyage progresses, and they last a lifetime. Simultaneously, it is understood from day one that everyone’s actions have consequences and that competency matters. Capt. Dan Moreland and his son, Dawson. Anchored in the background is the Danmark, the Danish full-rigger Moreland sailed for four years as bos’un. The “training” part of sail training means that experienced crew teach newcomers how to coil down, strike sail, brace sharp, steer a 300-ton sailing ship in a following sea and maintain all of the gear on which everyone’s safety and well-being depends. The “sail” part of sail training means that the winds, weather and sky are up close and personal, that the ship only goes if she is handled well, and that the satisfactions following a successful passage are deep and well-earned. Sail training today rests on the shoulders of sailors past. Moreland says he was lucky to have worked under some of the last Age of Sail commercial shipmasters, men who had come up between the two world wars in big schooners, barkentines and full-rigged ships. During the 1970s Moreland started out in the West Indian windjammer Maverick, under Capt. Jack Carstarphen, followed by four years in the brigantine Romance under the command of Capt. Arthur Kimberly. Kimberly had poured more salt water out of his sea boots than most people see in a lifetime. He could do anything aboard ship, based on experience in huge steel square-riggers, wooden cargo schooners and oil tankers in wartime convoys. Kimberly inspired young sailors with his dedication, his respect for the sea and its traditions, and his consummate old-school seamanship. Moreland later sailed four years as boatswain on the 800-ton Danish full-rigged ship Danmark. He remembers that on his first trip there were 97 Danes, one Norwegian and him. He had to learn Danish to survive — no easy task, but he insists it was worth it. “Danmark was the best square-rigged ship in the world at the time, the Rolls-Royce of deepwater sail training,” he says. He put eight trans-Atlantic passages under his belt, commanded by two highly respected captains. Later, after a few commands of his own, as he dreamed about getting a ship, he read every word written by the giants who’d preceded him: Joshua Slocum, Irving and Exy Johnson, Alan Villiers and others. Now, at 64, he has commanded Picton Castle for 24 years. 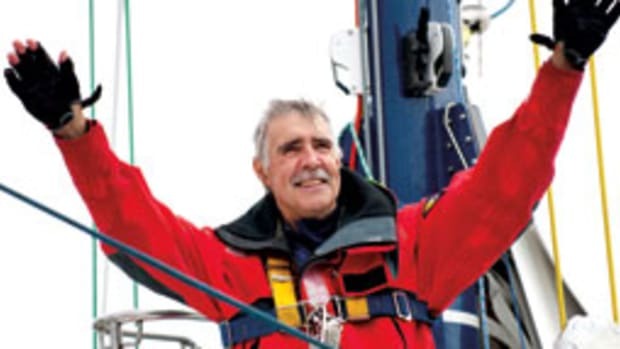 After having been honored as Sail Training International’s Sail Trainer of the Year in 2011 and earned a Tall Ships America Lifetime Achievement Award in Sail Training in 2017, he is the graybeard, passing on a lifetime of experience to the rising generation. 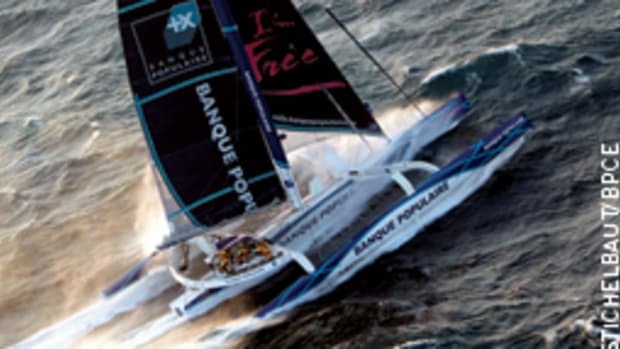 He says the 2018-19 circumnavigation will be his last. Anchorages in out-of-this-world places are one of the charms of a circumnavigation. No roads lead to this bay on the southern tip of Maewo, Vanuatu. I headed one watch as we motored down the coast of Norway to a Danish shipyard for an engine overhaul and haul-out. Those first two months, set against stunning Norwegian scenery, were a lark, as charming as they were challenging and rewarding. That is often the norm in ships. After my family and I left, the rest of the gang got the ship to England, then Madeira, Bermuda, New York City and finally, Lunenburg, Nova Scotia, a fishermen’s village with an abundance of talent: welders, shipwrights, carpenters and other tradesmen. Under Moreland’s keen eye, they refit the old Dolmar. The plumb-stemmed motor ship that arrived in Lunenburg departed as a beautifully proportioned double-topsail barque with a clipper bow — a real life ugly-duckling story ending with a swan. I stood on the pier and watched her leave for the first circumnavigation. The world awaited. Since then, she has logged more than a quarter-million miles, and her crews swear by her. Some years later, I sailed in her again, from the British Virgin Islands to South Carolina. Each day was a treat. Aloft under sail, I felt transported in time. Every voyager knows that the trip consists of four parts. The first is the ship herself: take care of her, and she will take care of you. Picton Castle crews have painted, tarred, greased, cleaned and overhauled every bit of steel, wood and line aboard. They have made the sails. They have sent yards up and down. After a few months, no matter the dark of night, their hands and feet know every inch of the ship. Their pride shows. She looks great, and the crew regard her as a living thing. Second is the crew. Shipmates often make fast friends on a world trip. Everyone knows that they are dependent on others for the voyage’s success. It is clear as well, however, that shipmates must give one another space in tight quarters, and honor one another’s personalities. There is a knack to long-distance voyaging. It requires a bit of human balancing. Third is passagemaking, sailing those apparently endless bluewater miles. Crews underway develop a rhythm. From departure to landfall, they sort themselves out through dawn watches, engine room checks, scullery duty, sail handling, lookout, steering, eating and sleeping. There is something magical about that rhythm, distanced as it is from the helter-skelter pace of modern life. It is one of the great satisfactions of deepwater voyaging. Fourth is port calls, the icing on the cake. 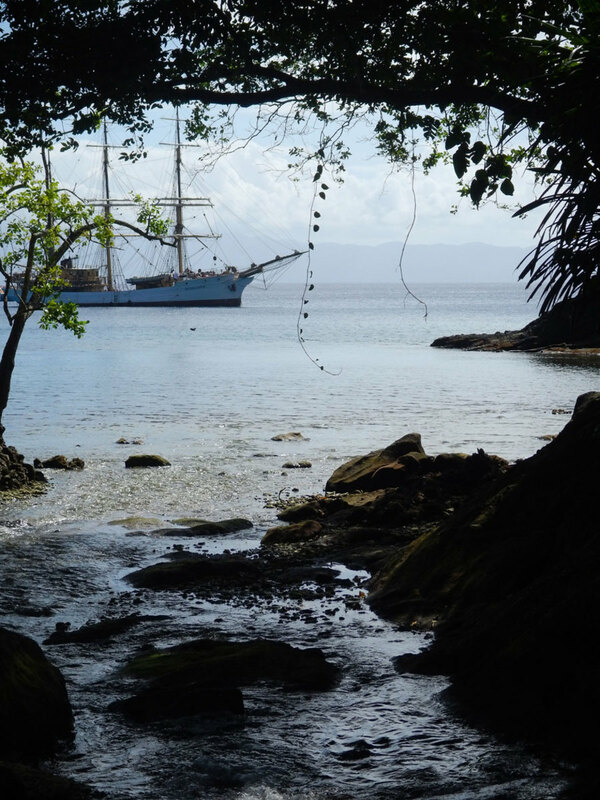 Picton Castle’s circumnavigations always include passing through Panama and its wondrous canal; spending nights ashore in locals’ homes on Pitcairn; dancing in isolated villages on Polynesian atolls, where crew mix it up with locals; hiking in the volcanic mountains of Rarotonga; and delivering supplies or providing medical services in remote island communities. Then there is drinking in waterfront pubs through a host of time zones; touring Bali’s Hindu temples, with their exquisitely carved decorations; taking in Cape Town’s nightlife; and soaking up the eastern Caribbean, with its booming reggae, traditional boatbuilding and vibrant island culture. Aboard “the Castle,” one goes around the world and into it. No one returns unchanged. 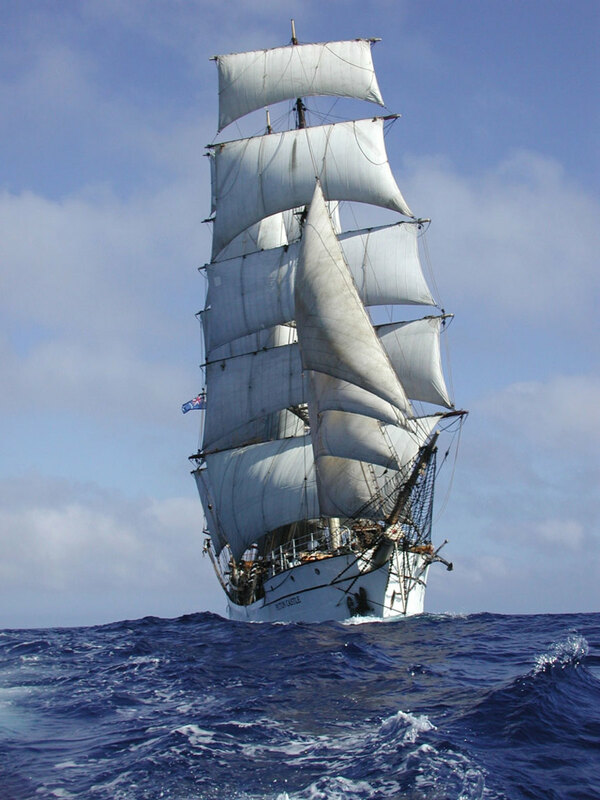 A square-rigger under full sail is a sight to behold. Picton Castle’s 23 sails are made on board. Moreland likes to say that when he embarked on Picton Castle’s first circumnavigation, someone told him that there were more people alive who had walked on the moon than had sailed around the world in a square-rigger like his ship. He and his crews have rejuvenated something precious that was fading. He is determined to keep those traditions and skills alive. Not surprisingly, his tenacity is magnetic. Picton Castle attracts an extraordinarily diverse cross section of humanity: young and old, male and female, black and white, skilled hands and green hands, Americans, Canadians, Scandinavians, West Indians, Tongans and others. The one thing they all share is vision. It would be impossible to embark on such a voyage without a hunger for adventure and the vision to see yourself in faraway places, nurturing what was once a common way of life, but is no more. Imagine yourself with a knife on your hip and pine tar on your hands — at the lookout, at the braces or at the wheel, steering for a distant horizon. It’s those visions that pull extraordinary people to the trip of a lifetime. To learn more about voyaging aboard Picton Castle, including doing specific legs of the circumnavigation, go to picton-castle.com or email info@picton-castle.com. Traditionalists can write to Barque Picton Castle, Box 1076, 135 Bluenose Drive, Lunenburg, NS, Canada BOJ 2CO.